Fall is my favorite time of year and even though we've only had a few days in the 80's I always get in a Fall mood as my anniversary 9-24 approaches. My husband and I got married in Norfolk, VA and it just so happens that the weather that year was just as hot as it is this year, but in VA the leaves were already starting to turn. We didn't have a car then and my bus rides and walks to the library are some very fond memories. This wonderful pumpkin stack is stamped on the card then on different pattern papers, cut out, inked around the edges of each piece and glued on. I added the green at the bottom so they wouldn't be floating, some very light splots, and my handwriting sentiment. Supplies: Ivory Card Blank 4" X 5 1/2" Halcraft, Papers: SU-Designer Series Prints Pumpkin Pie, Specialty Designer Series Paper Autumn Spice, Stamps: Northwoods Rubber Stamps, Inc-Pumpkin Stack, SU-Itty Bitty Backgrounds, Ink: SU-Old Olive, Early Expresso, SU markers-Old Olive, Early Expresso, glue pen. This is so cute! Love that stack of pumpkins! Love this pumpkin stack Beverly! I keep thinking about doing a real one on my porch..maybe someday! Beverly, this is one of my favorite cards for this week's challenge...so sweet and clean and simple and perfect for FALL! Happy Anniversary to your and your husband (soon)! 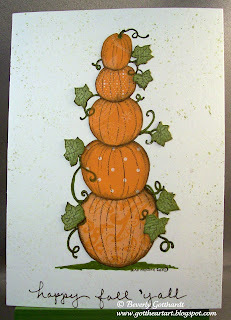 This is such a fun card, love the different paper pieced pumpkins. Thanks for playing at CAS-ual Fridays! Such an elegant stack of pumpkins! Thanks for playing along with us at CAS-ual Fridays!